Projected outcomes: plurality or parity? As I type this article, about half an hour before the polling stations close, forecasters have seen some tightening of the projected number of seats between the Conservatives and Labour. 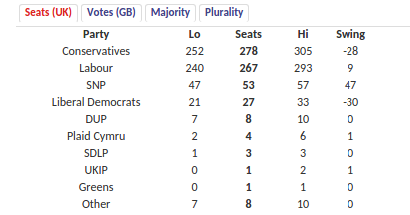 Even yesterday, a Conservative plurality with a difference of a good few seats seemed most likely, there may be a parity between the two parties, at least according to the Guardian website. The Conservatives are down from 276 to 273, whereas Labour has gone up from 269 to 273 (picking up three seats from the Conservatives and another from the SNP), in comparison from yesterday, and resulting in a parity. 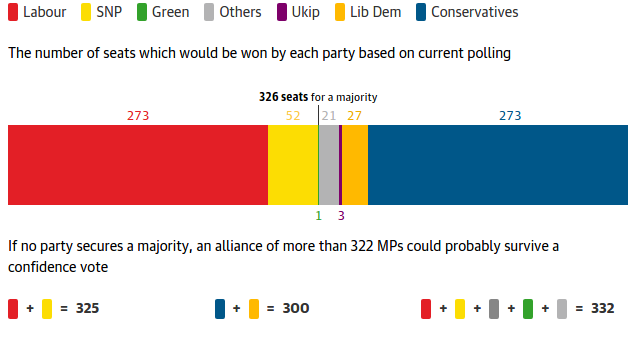 On www.electionforecast.co.uk, the Conservatives are still projected to achieve plurality, but the Tories are down 3 seats, from 281 to 278, compared to the projections from yesterday. Labour is up by one seat from 266 to 267. The difference shrunk from 15 to 11. On www.electoralcalculus.co.uk, both the Conservatives and Labour are down in the projections compared from yesterday, by 2 seats and one seat respectively. Electoral Calculus still gives the highest number of seats for the two biggest parties in the three compared here, 280 and 274 for the Conservatives and Labour respectively, and it has been consistent in forecasting a lower number of seats for the Liberal Democrats in comparison to the other two mentioned above. It will require a brave soul to call it at the moment, because very tight results – and there is bound to be a few – in a number of constituencies can really influence the outcome, and the resulting political narrative. Will the exit polls be wildly different? We are in for a long night.